Yes, there have really been 20 years of GTI Festivals. The inaugural event back in 1993 was staged at Avon Park Raceway – and back then the ‘Outrage II’ VW Funny Car ran a backed-up World Record of 7.70 seconds on the quarter-mile at that event – and just like the GTI Festival – that record lives on. Back then, the only other GTI show was ‘Inters’ and virtually the only club, was Club GTI. Things have changed massively in the intervening two decades, with regular events throughout the year these days – and many, many clubs now having been formed. The GTI Festival itself has moved venues a few times before finally settling at Santa Pod – and was moved it to its October date to help avoid the show calendar congestion that summer seems to bring. The GTI Festival – ‘Season Finale’ is for enthusiasts of all VAG vehicles, SEAT, Skoda, Audi and of course Volkswagen. It is a show where ALL VAG vehicles are welcome with open arms. All clubs are invited to display during the day, and after a very well received revamp of the show layout a few years back – the clubs area is now easily able to accommodate the 40+ clubs who regularly attend the event. The GTI Festival has ALWAYS been about the cars – and these days the Show & Shine has a massive number of awards including Best Audi, Best Skoda, Best SEAT, and of course, Best VW. With Best Engineering, Best Paint, Best Engine, Best Van and more – and ‘Top Twenty’ trophies open to all marques – the Show & Shine at GTI Festival has awards for all VAG marques. 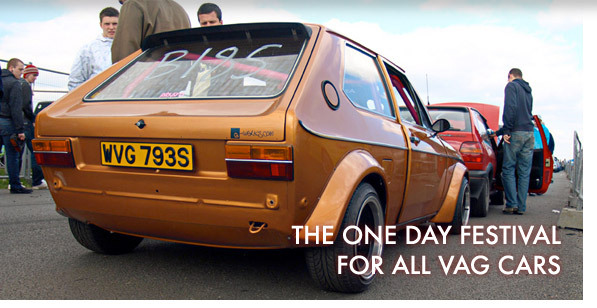 Only VAG vehicles are permitted on the hallowed Santa Pod quarter-mile at the GTI Festival – and – as pioneered by NAS Events all those years ago, your signing-on fee is for the entire day, not just for one or two runs. Awards on the track include quickest VW, Audi, SEAT and Skoda, as well as a number of awards based on engine sizes across all marques. With the addition of the Dizzy Rascals Handling Circuit, Traders, Girlz N Dubz, Autojumble and Club Displays – we hope that the GTI Festival has something for every VAG enthusiast.